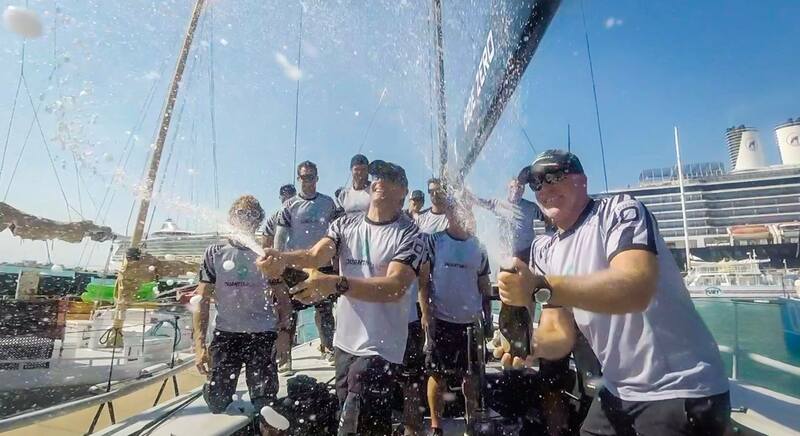 Showing the winning hallmark of a crew that are current 52 SUPER SERIES champions, and three times holders of the title, Doug DeVos’s Quantum Racing team came back from an uncharacteristic high scoring, mid-regatta, three-race slump, to close out the first regatta title of 2017, triumphing in today’s last race of Quantum Key West Race Week. A hard fought win - Quantum Racing celebrates their win at the 2017 Quantum Key West Race Week. Photo by Keith Brash. Wednesday’s 8,7,9 accumulation of 24pts was immediately counterbalanced by a second and two first places. With DeVos on the helm, Terry Hutchinson calling tactics and newcomer Bora Gulari completing his first regatta as strategist, Quantum Racing today were quickest off the start line in the very light southerly breeze and led at every mark. The circuit title holders stepped well clear of what proved to be an incredible six-sided tussle for the remaining podium places. When the final finish guns had sounded, the dust settled and heartbeats dropped closer to normal, Harm Müller-Spreer’s Platoon took second place overall but only on a three way tie-break with Niklas Zennström’s Rán Racing. They are credited with third ahead of Ergin Imre’s Provezza. All three finished the 10-race curtain raiser regatta locked on the same tally, 49pts, but perhaps the crew feeling the most anguish will be Provezza. As the 52 SUPER SERIES starts its sixth season, this popular 30th anniversary Quantum Key West Race Week proves that this TP52 fleet competition has never been closer. Only two points separate second from an excellent seventh-placed debut from Austin and Gwen Fragomen’s new Interlodge. Provezza may today rue their final start, but during the week most teams had at least one big let down, Interlodge had an 11th when a lifeline gave way, Azzurra unnecessarily locked horns with Paprec. Platoon started poorly in the second race on Thursday. Such episodes may be more memorable for the teams, and observers, but in truth the single points have never been more valuable, harder than ever to gain and easier to shed. So each crew will leave Quantum Key West Race Week contemplating similar circuitous discussions, soul searching and debriefing the lost places. But at the same team at least six teams leave the Conch Republic today having empirically validated their belief that they have hardware, performance and personnel to win regattas. All of the top three boats at this regatta, from the 11-boat fleet that represents seven different nations, are steered by owner-drivers, DeVos, Müller-Spreer, and Zennström. The five-day regatta provided a fulsome range of wind conditions, starting out with 17-20kts of SE’ly breezes for two near identical days Monday and Tuesday. Platoon’s season opened with two wins Monday but they went 6,6 on Tuesday. Because the breezes were forecast to drop, the race officers ran three races Wednesday in 10-11kts, and by Thursday-Friday the fleet were in light wind modes, in 6-8kts for the last three races. 2017 Quantum Key West Race Week - Gladiator. Photo by Keith Brash. “He was saying breathe and calm down. That’s the main thing. Calm down. And sail like we know how. Don’t over think it. Just let it happen. Sail crisp but remember our fundamentals. Don’t try to do too much, sail the way we’re supposed to. That’s why the breathing helps, to calm down and don’t let the moment get too much of us and just sail the boat. And it worked out. The southerly breeze was as light as six knots and rarely cracked into the double digits. And there were shifts and holes galore. Quantum Racing avoided pre-start entanglements, starting cleanly on the middle of the line. Skipper Doug DeVos and tactician Terry Hutchinson turned a bit more wind on the left side of the course into a solid lead at the top mark. Interlodge – who started at the pin, but downspeed after a tense pre-start battle with Provezza – was second, with Bronenosec, Sled and Azzurra also in the top five. Notably absent were leaders Provezza along with contenders Platoon and Rán Racing, all of whom struggled on the first beat. While it wasn’t the sort of day to take any lead for granted, Quantum did a solid job of playing defense the rest of the way. By the time the defending champions turned the final mark and headed for the finish, first place in the regatta was a foregone conclusion. The real question was who would take the remaining spots on the podium. That place was decided by the slimmest of margins. Harm Müller-Spreer’s Platoon battled throughout the race for a seventh, which was good enough to guarantee them second in the regatta, winning on countback from Niklas Zennström’s Rán Racing and Ergin Imgre’s Provezza. Azzurra and Bronenosec tied for fifth, with the Italian/Argentine team winning that battle. In seventh was Interlodge, who lost a chance on the podium when Bronenosec slipped past on the first run. In all, just two points separated second from seventh. Platoon GER (Harm Müller-Spreer, GER), (1,1,6,6, 10,2,5,3,8,7) 49 pts. Rán Racing SWE (Niklas Zennström, SWE), (4,6,9,4,3,4,6,1,6,6) 49 pts. Provezza TUR (Ergin Imre, TUR) (8,9,2,2,4,5,2,5,3,9) 49 pts. Azzurra ITA (A & P Roemmers, ITA/ARG), (6,2,3,8,2,6,4,6,5,8) 50 pts. Bronenosec RUS (Vladimir Liubomirov, RUS), (7,4,5,3,7,3,11,4,4,2) 50 pts. Sled USA (Takashi Okura, USA), (2,5,8,11,6,11,3,9,9,5) 69 pts. Gladiator GBR (Tony Langley, GBR) (10,10,1,9,5,9,7,11,7,11) 80 pts. Alegre (Andrés Soriano GBR/USA) (11,3,7,10,9,10,10,10,10,4) 84 pts. Paprec Recyclage (Jean-Luc Petithuguenin, FRA) (9,11,10,7,11,8,1,8,11,10) 86 pts. “Big relief. I felt like I made a difference and that was good. I had a positive contribution. I think the points were close enough that it was basically who-beat-who. It was more not worrying about points, but just having a second race. Second lap we started looking where people were. But it was pretty easy, obviously, once we’d sniffed our way to the front. “We decided we really wanted to go for the pin, try to win the pin. Unfortunately one other guy also wanted it badly, so it’s high risk. He just did a better job than I did of wiggling the boat, getting it in position and really just left with no speed, nowhere to go. It’s pretty easy to see my mistake. When one guy is turning left, you need to be turning right. If he gets in sync with you, he’ll stay close to you. That’s how it worked out. “[Second place overall] is pretty fine. If somebody would have asked me in advance if I would take a second place overall, I would say yes, definitely yes. I’m not disappointed. We are on a really good track and I can see big potential in this team, this boat. So looking forward. Quantum Key West Race Week, January 16– 20. 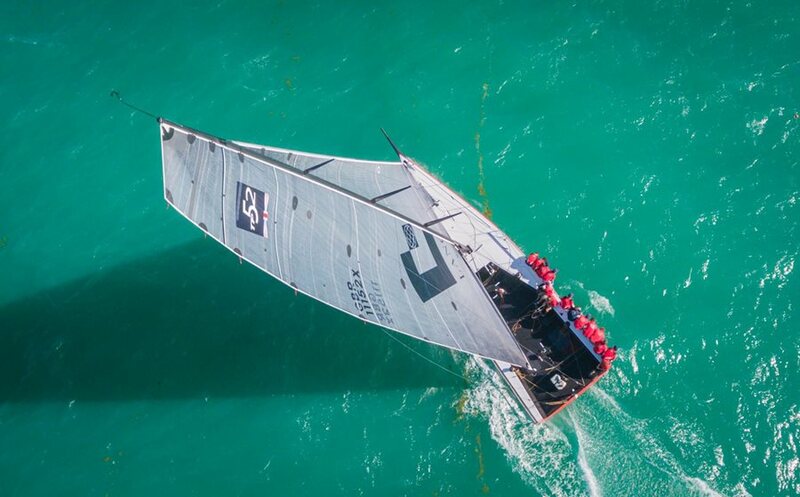 52 SUPER SERIES Miami Royal Cup, March 6 – 11. TP52 World Championship SCARLINO 2017, Scarlino, May 15 – 20. Porto Cervo 52 SUPER SERIES Sailing Week, June 20 – 25. Puerto Portals 52 SUPER SERIES Sailing Week, July 23 – 28. Menorca 52 SUPER SERIES Sailing Week, September 18 – 23.